Oscar contenders, start your engines! The race has finally begun as the Academy finally unveiled their full list of nominations for 2018. As expected, the romantic fantasy The Shape of Water leads the way with a commanding thirteen nods which include the all-important Best Picture mention. 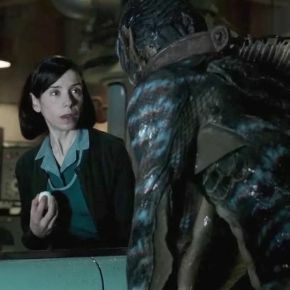 The film, which focuses on a mute woman who falls for an Amphibian man, also scored a Best Director nod for Guillermo del Toro. Stars Sally Hawkins (as mute cleaner Elisa Esposito), Richard Jenkins (as Elisa's homosexual neighbour Giles) and Octavia Spencer (as Elisa's work colleague Zelda) were all recognised in Best Actress, Best Supporting Actor and Best Supporting Actress respectively. The World War II drama Dunkirk is second in the nomination count with eight which includes Best Picture as well as a first Best Director nod for Christopher Nolan who had previously been overlooked for his work on The Dark Knight (2008) and Inception. The comic-drama Three Billboards Outside Ebbing, Missouri has seven mentions including Best Picture to follow up its recent successes at the Golden Globes and Screen Actor's Guild. However director Martin McDonagh was surprisingly snubbed in his category though he does receive a nod for his original screenplay. Best Actress frontrunner Frances McDormand (as scorned Missouri citizen Mildred Hayes) is nominated alongside her two male co-stars Woody Harrelson (as conflicted lawman Chief Willoughby) and Sam Rockwell (as immature and violent officer Jason Dixon) who are both up for Best Supporting Actor. Elsewhere, the psychological horror Get Out and the indie-comedy Lady Bird both performed well as they picked up key mentions in Best Picture. Both Jordan Peele (Get Out) and Greta Gerwig (Lady Bird) are recognised for their directing AND screenplays. British starlet Daniel Kaluuya (as tormented African-American man Chris Washington) receives his first Oscar nod for his lead role in Get Out while Lady Bird's Saoirse Ronan (as rebellious teenager Christine McPherson) and Laurie Metcalf (as Christine's concerned mother Marion) are acknowledged in Best Actress and Supporting Actress respectively. One film that surprisingly performed well was the romantic drama Phantom Thread which picked up six nominations including Best Picture and an unexpected Best Director nod for Paul Thomas Anderson. In what is said to be his final film role, the great Daniel Day-Lewis (as dressmaker Reynolds Woodcock) is recognised in Best Actor while co-star Lesley Manville (as Reynolds's sister Cyril) is up for Best Supporting Actress. The rest of the Best Picture lineup is completed by historical biopics Darkest Hour (six nods) and The Post (two nods) plus the romantic drama Call Me By Your Name (four nods). In the acting categories, Gary Oldman (as British prime minister Winston Churchill) receives his second Best Actor nomination for Darkest Hour and will be competing against youngster Timothee Chalamet (as homosexual teenager Elio) in Call Me By Your Name, Daniel Day- Lewis, Daniel Kaluuya and previous winner Denzel Washington (as defence attorney Roman Israel) in the drama Roman J. Israel, Esq. In Best Actress, the great Meryl Streep (as real-life Washington Post publisher Katharine Graham) lands a remarkable 21st nomination for her performance in Steven Spielberg's The Post and is up against Sally Hawkins, Frances McDormand, Saoirse Ronan and a first nod for Australian beauty Margot Robbie (as controversial ice skater Tonya Harding) for the sports biopic I, Tonya. Less than three months ago, Christopher Plummer was not even involved with the real-life drama All the Money in the World yet having replaced Kevin Spacey, he receives a unique Best Supporting Actor nod for his portrayal of billionaire J. Paul Getty. His competition in that category includes Willem Dafoe (as motel manager Bobby) for The Florida Project, Richard Jenkins and Three Billboards duo Woody Harrelson and Sam Rockwell. The Supporting Actress lineup sees Lesley Manville, Laurie Metcalf and Octavia Spencer up against category favourite Allison Janney (as Tonya Harding's abusive mother LaVona Golden) for I, Tonya and pop singer-turned actress Mary J. Blige (as sharecropper Florence Jackson) for Mudbound. There were some notable acting snubs with recent Golden Globe winner James Franco (The Disaster Artist) being overlooked following allegations of sexual misconduct along with the likes of Tom Hanks (The Post), Jessica Chastain (Molly's Game), Hong Chau (Downsizing) and Holly Hunter (The Big Sick). Elsewhere, a number of blockbusters received key mentions including Baby Driver, Beauty and the Beast, Blade Runner 2049, Guardians of the Galaxy Vol 2, Kong: Skull Island, Logan and War for the Planet of the Apes. Despite its diverse reviews, Star Wars: The Last Jedi also performed well with four nods which include yet another Best Original Score nomination for the great John Williams. Pixar's Coco is the favourite to win Best Animated Film and is up against the likes of The Boss Baby, The Breadwinner and Ferdinand. The biggest films to be ignored by the Academy altogether included Battle of the Sexes, Detroit, Downsizing, The LEGO Batman Movie, Murder on the Orient Express, Stronger and Wonder Woman. The 90th Academy Awards ceremony will take place at the Dolby Theatre on Sunday 4th March with Jimmy Kimmel hosting for the second year in a row. BLADE RUNNER 2049, John Nelson, Gerd Nefzer, Paul Lambert & Richard R.
CALL ME BY YOUR NAME, "Mystery of Love"
THE GREATEST SHOWMAN, "This is Me"
MARSHALL, "Stand Up for Something"